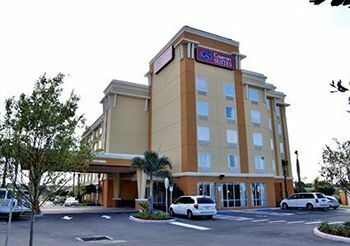 We are located a few miles away from the Orlando International Airport! Free Shuttle is provided to all Book2park.com customers to/from the airport. Shuttle runs from hotel every hour on the half hour between 4:30am and 1am. Reserve shuttle 1 day ahead. Pickup on demand:call 407-812-9100 for pickup from airport. Parking Instructions: Please enter the lobby and do parking check-in first. Our rates are much cheaper than parking at the Orlando International Airport. Park with us and see the exceptional Comfort Suites way! Give yourself at least 30 minutes extra for check-in and transfer to airport. We are not responsible if you show up late and miss your flight.